Looking for an amazing children’s book about empathy, one that touches on compassion, kind words, giving and gratitude? We’ve got just the book for you — it is all those things rolled into one incredible story!! So totally in love with this one, you guys. What is Given From the Heart is simply PHENOMENAL. It is powerful and beautiful and the most tender and perfect ode to kindness - one of the best kids’ books I’ve read in a long time, especially if you are looking for fabulous children’s books about empathy. If you’ve followed me for a while, you know I love to showcase what I call “books for better” (#booksforbetter) here on Happily Ever Elephants. Well, What is Given from the Heart, the fabulous new book by the late Patricia C. McKissack and illustrated by April Harrison, is the epitome of this phrase. This is one of McKissack’s last books -- and it’s such a perfect one to highlight. It is an absolute must for everyone - I’d say kindergarten or first grade on up. It would make an incredible read aloud for upper elementary, middle school and high school aged children. Why? Check it out! In What is Given from the Heart, James Otis and his Mama don’t have much. His father died, they lost their farm, and when Christmas rolls around, there isn’t much to open. It’s been a rough couple of months for sure, but they have their health and strength, so Mama says they are blessed. On the Sunday before Valentine’s Day, their reverend makes an announcement during services: the Temple family has lost everything in a fire, and everyone will make a Love Box containing whatever they think might be helpful to the family. James Otis wonders hard - what should he give that the family will like? What would a little girl named Sarah want from him, a boy who has so little? James Otis thinks and thinks, and he suddenly comes up with an idea. It certainly comes from the heart - but will it be enough? Empathy? Check. Kindness? Check. Generosity? Check. Compassion? Check, check, check. My goodness. To say this book is extraordinary doesn’t even do it justice. In my eyes, it’s sheer perfection. It teaches every human being, no matter how old or how young, that even those who have so very little still have so much to offer to others. Sharing from the heart is inherently good, and McKissack’s narrative powerfully conveys how generosity and compassion can change lives. Though the narrative touches on challenging issues - from the death of a parent to poverty - the story never takes a downward spiral. Instead it is uplifting and poignant, celebrating life, ingenuity and the spirit of giving on each and every page. And those illustrations. Breathtaking! Harrison captured the essence of McKissack’s words perfectly with exquisite illustrations that elevate the text and so beautifully dignify the characters. I simply cannot rave about this one enough. It is pitch perfect and a must read for every child, even those of you with tweens and high schoolers. 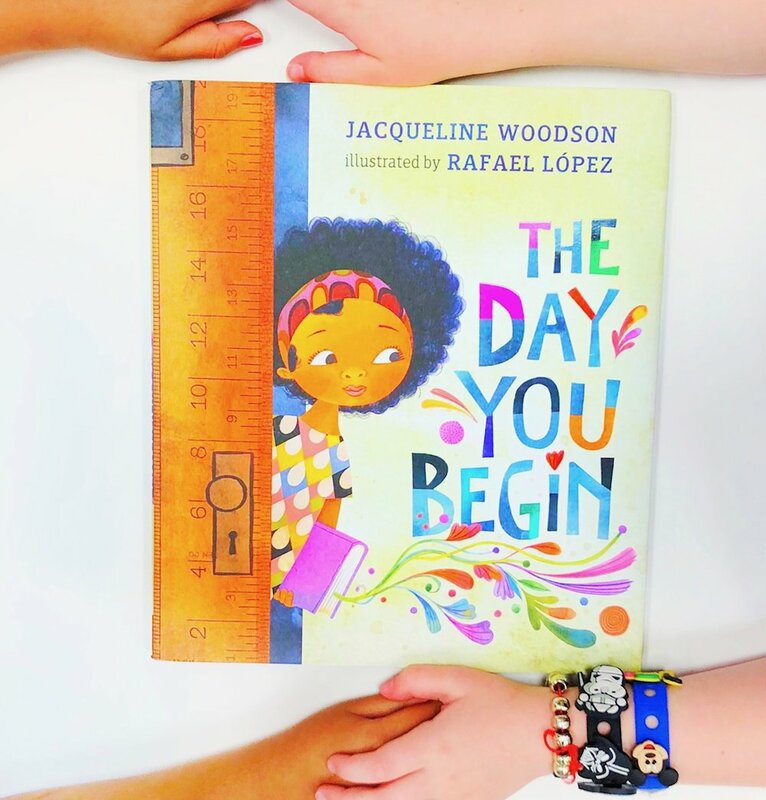 If you are looking for the perfect children’s book about empathy, this is the one for you! Books like What is Given From the Heart are why I believe words can truly change worlds. Simply put: What is Given from the Heart is a masterpiece by a brilliant writer who will be so very missed. “What is given from the heart reaches the heart.” There are no truer words than those, and there is no more stunning story than this. Did you like this post? We are so glad! Check out these fantastic lists - we think you will love them too! And for the books we loved from last couple of years, check out Favorite Picture Books from 2018 and Favorite Picture Books from 2017! Are you following us on social media? Make sure to check us out on Instagram, Twitter and Facebook! Favorite Books about Democracy in Action! We spend a significant amount of time impressing upon our children those qualities we hope they eventually embody: kindness, respect, honesty, self-confidence. We do everything we can to teach them right from wrong, to be upstanders in their classrooms and to be selfless in their actions. Our goal is to create a generation of gracious, honest and generous leaders, children who grow into adults that want to both BE good and DO good. In light of our current climate, though, there’s something else we must strive for, something that holds equal importance. We are privileged to live in a country where we can make our voices heard. We have inalienable rights, we have freedoms, and we have the power to elect representatives. So how do we make sure we raise children that understand these rights, participate in the democratic process and also take an active role in protecting and defending our freedoms? The point? Even young children can grasp the basics of our government and the importance of protecting the fundamental ideals our country was founded upon. Midterm elections are fast approaching, making it a perfect time to talk with your kids about how our government works, why we vote, how we got the right to vote and how we choose which candidates we want to represent our voices. This is not just important - it is essential if we seek to forever safeguard our constitution and the healthy functioning of our government. We’ve been reading a lot in our house, and from fun fiction picture books for your littlest kids to non-fiction works for your older children, Happily Ever Elephants has a new list to help provide you with some fabulous books to explain democracy in action. We sincerely hope you enjoy this list, share it widely, and, most importantly, vote on November 6! 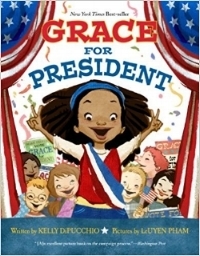 Grace for President, by Kelly DiPucchio and illustrated by LeUyen Pham: When Grace learns there has never been a female president, she takes matters into her own hands and decides she must be the next president of her school. Grace thus enters the race, only to find herself running against another student who claims to be the “best man for the job” and has already captured all of the boys’ votes. Instead of getting nervous, Grace buckles down and runs on the platform that she is the best “person” for the job - and she may have just what it takes to go all the way! 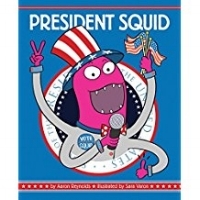 President Squid, by Aaron Reynolds and illustrated by Sara Varon: What makes a good leader? Is it the size of his house? The tie he wears? Having a book named after him? President Squid is satire at its finest, providing young readers with a keen look at the qualities needed to be the big boss. We use this book frequently at school to discuss the important qualities any leader must possess, whether in the classroom or in the White House. 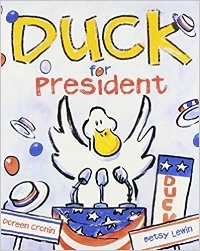 Duck for President, by Doreen Cronin and illustrated by Betsy Lewin: Duck isn’t happy with life on his farm, so he takes matters into his own hands and organizes an election for a new leader. Who wins? Duck wins! But Duck’s ambitions don’t end at his farm alone. He next makes a run for governor and then for president… and through it all Duck learns that being a leader requires quite a lot of hard work. 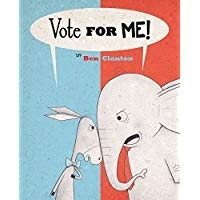 Vote for Me, by Ben Clanton: This is quite the satire on the current state of American politics, featuring a donkey and an elephant in the throes of an election. It is a witty take on the nomination process and the negativity that often prevails, showcasing how absurdities are made prevalent and how mud-slinging tactics are often utilized to make a candidate’s case. Is this the right way to campaign? Does it detract from the real issues? This is a fabulous picture book for prompting important discussion with your older readers. What’s the Big Deal About Elections, by Ruby Shamir and illustrated by Matt Faulkner: I absolutely adore this non-fiction book. It is jam packed with information and is fabulous for kids of all ages - just pare it down for your younger kids, or go over every important word with your older ones. 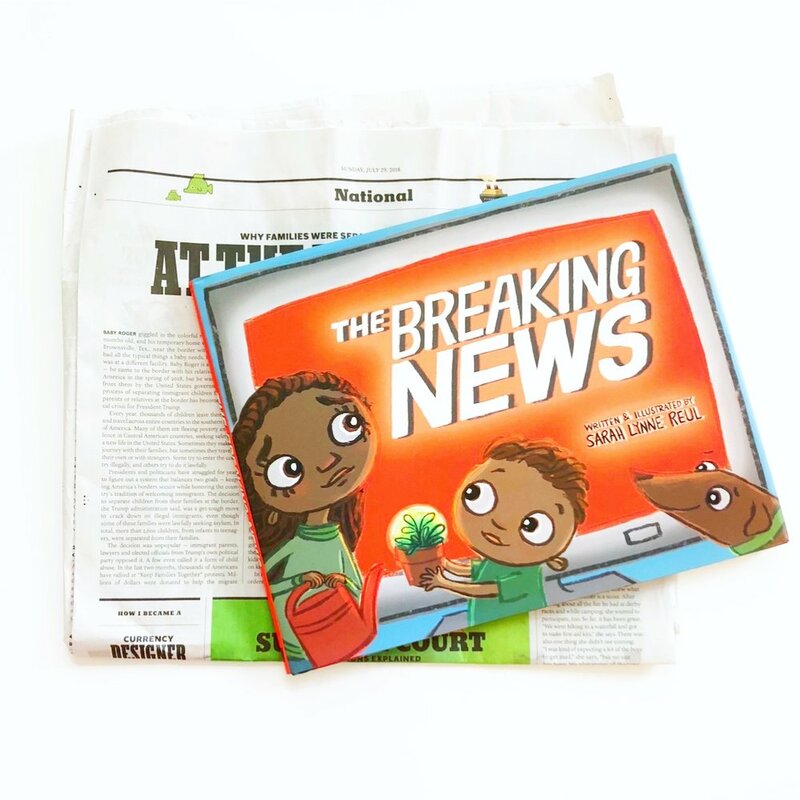 This book is as fun as it is informative, featuring not just information about voting rights, our branches of government and the role of the electoral college, but also wacky facts and trivia to delight readers of all ages. This is a must for every home and library! Lillian’s Right to Vote: A Celebration of the Voting Rights Act of 1965, by Jonah Winter and Shane W. Evans: This is a powerful historical picture book about a 100 year old African-American woman who makes a long trek up a steep hill to vote for the very first time. 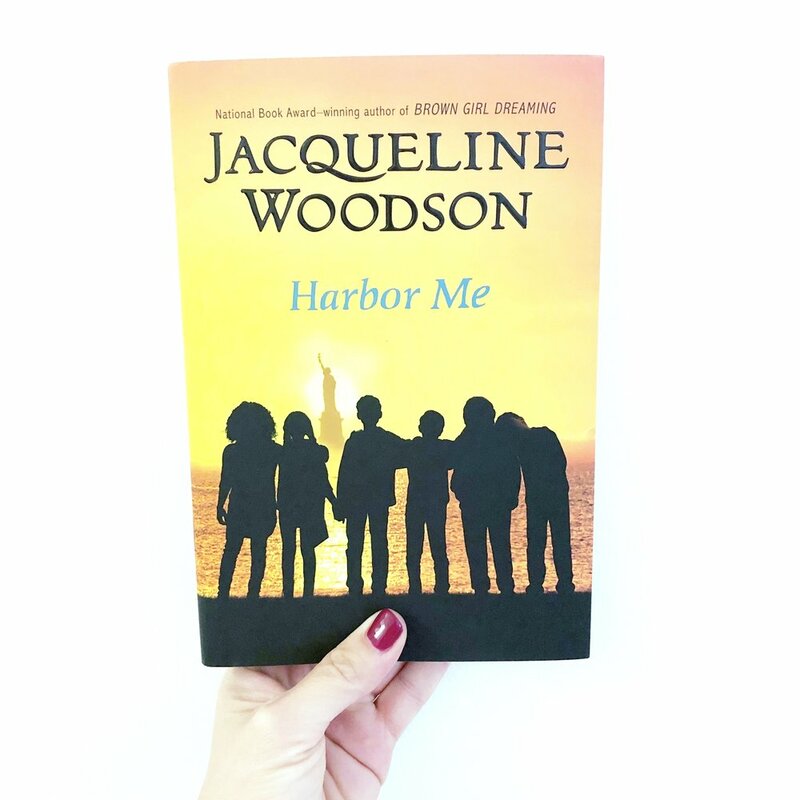 As she walks, she remembers her family history — from the passage of the fifteenth amendment to her parents registering to vote, from the impossible tests given to prevent blacks from voting to marching in the civil rights protest from Selma to Montgomery. Moving, lyrical and tremendously important, this is a fabulous glimpse at American history. 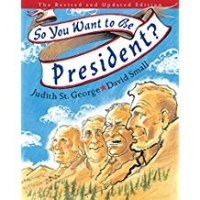 So You Want to Be President, by Judith St. George and illustrated by David Small: Take a walk through the first forty-one of our nation’s presidents, including wacky “tips” to abide by if you want to make it to the White House and some of the zaniest characteristics exhibited by our leaders. A fun and funny read with some fabulous information! If I Ran for President, by Catherine Stier and illustrated by Lynne Avril: What would it take for you to run for president? A lot of hard work, that’s for sure. This is a fabulous primer for young readers about how one runs for president. What is a caucus? What is a primary? What is a debate? Simple answers to these questions, with fun and humor inserted throughout the pages, make this book a winner. 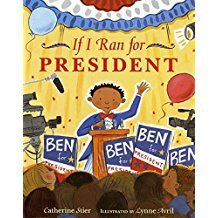 If I Were President, by Catherine Stier and illustrated by DyAnne DiSalvo-Ryan: Whereas If I Ran for President talks about actual campaigning, If I Were President discusses what happens when you make it to the Oval Office. From promising to protect the Constitution to the perks of being president to the notion of creating laws for the entire country, this is a simple and fun overview of the presidency for young readers. Around America to Win the Vote: Two Suffragists, A Kitten and 10,000 Miles, by Mara Rockliff and illustrated by Hadley Hooper: In 1916, two women set out on a mission— to drive 10,000 miles across America to make their voices heard. What message did they want to share? That women should have the right to vote, of courses! This is a fascinating look at a fascinating journey during the women’s suffrage movement, featuring two strong women who would brave all the elements to further one singular, critical cause: equal voting rights for women. Lively and vibrant, this book rocks! When you Grow Up to Vote: How Our Government Works for You, by Eleanor Roosevelt, Michelle Markel and illustrated by Grace Lin: This is a phenomenal, updated reissue of a chapter book that Roosevelt first wrote in 1932 when her husband was elected president. The book talks about something many children don’t always recognize- the government works for the people! The book begins by talking about government workers, then moves through explanations of our local and national governments, thus providing young people an exemplary overview about how our government is designed to function. A wonderful, informative and easy to understand book for your tweens! The imagination is a powerful tool. So powerful, in fact, that it can transport a child from tough circumstances to a world where he can settle amidst more comfortable or even luxurious surroundings. But what about those kids who recognize that another child may be imagining things that aren’t exactly real? What about those kids who want to shout from the rooftops that one of his peers is a dirty rotten liar? It’s a difficult situation, no doubt. We learn as children to be honest, but the truth is that the imagination can be a powerful and wonderful defense mechanism for some, so much so that their imaginary worlds provide them with significant comfort. Enter Adrian Simcox Does NOT Have a Horse, written by Mary Campbell and exquisitely illustrated by Corinna Luyken. In this poignant story, Adrian Simcox tells his classmates that he has a horse- and not just any horse. Adrian’s horse is the best and most beautiful horse in all the world. But Chloe knows Adrian is lying. After all, Adrian Simcox lives in a tiny house and has holes in his shoes, so there’s no way he has a horse in his backyard. And the more Adrian talks about this beautiful horse, the angrier Chloe gets... and the more she wants to prove him wrong. Will vindication give Chloe the satisfaction she so desires? 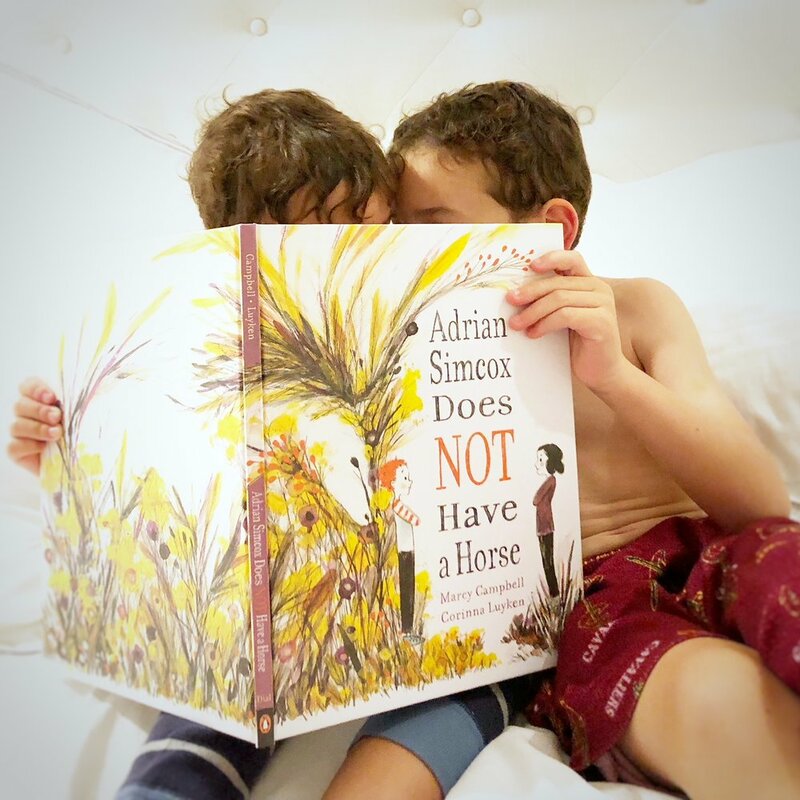 If you are looking to nurture empathy in your children or students, Adrian Simcox Does NOT Have a Horse is a touching new picture book for your collection-- a must have, in our opinion. Campbell’s light touch is evident throughout this book, especially through her subtle text and the way Chloe comes to realize why Adrian may be lost in his imagination. Should Adrian's circumstances matter if he isn’t being truthful, and how on earth do we explain perspective to children? I love the way this story so beautifully encourages kids to walk in other’s shoes, as well as the manner in which it helps children recognize that indulging a classmates' fanciful stories is sometimes ok - especially if it helps that child make his personal living conditions easier to bear. Adrian Simcox Does NOT Have a Horse is a classic in the making, and I absolutely cannot wait to read it to my students when school begins. Want the book? Get it here! Adrian Simcox Does NOT Have a Horse, by Marcy Campbell. *This is an affiliate link. HEE received an advanced review copy of this book, but all opinions expressed herein are entirely our own.